How are you still here? How am I still here? Yo. I wanna be a member of that Hyrule Warriors group. Cool. With Hyrule Warriors Legends coming out< I'll try to bring it back to life. Strix means Sticks+Skrillex? Skrillticks owls! Ooh I'm pranked now! Awesome! The feeling when Smashboards claims you have adblock, but has an ad right underneath. New avatar! Thanks again to Flight for helping with the image! Wanna rate my avatar in the avatar thread? No prob! From what I've seen of you in the Social Thread, you seem like a nice guy. I guess I am. Been trying to be nicer as of lately. New avatar! Thanks to SmashRiver64 and Flight for help cropping the image! I shall be Goombawesome again for an unknown amount of time. The "unknown amount of time" was about an hour and twenty minutes. Kudos if you know what this avatar is! I am Goombawesome once more. IT IS YOU WHO IS GOOMBACTUALLY WRONG! You are one of the least Goombaccurate people I know. And I am the Goomball seeing eye in the sky, so I know a LOT of people. If my calculations are Goombaccurate, I know, oh, I'd say about EVERYONE. This tragic event of Nintendo's beloved president's passing is horrible for everyone. My condolences go to Iwata's family and friends. Ive been looking through old posts in the Social Thread 2.0 from last year, and it's taking all my determination to not like a ton of posts. And I hate the 140 character limit. This post was exactly 140 characters. Henry x Lissa is the best ship. Henry MUST marry either Olivia or Lissa every playthrough. Anything else is WRONG. Then why do they flap and have a ton of feathers? I think someone needs to learn their terminology. Nya ha! Wow. You taped a chicken to your back! Cool! Fly, my little chicken! Nya ha! Uhhhhh... No and no. It's Henry from Fire Emblem Awakening. YAAAAAAYYYYY! I'm pranked! YAAAAAYYYY! Purple name party! Oh yeah. Everyone I conquered now isn't conquered, since I'm not Walhart anymore. So now I'm gonna start handing out death curses! Yaaaayyy! Our hero's looking a little goth today. I hope the stresses of life haven't gotten you down. That would be ever so tragic. You won't understand it all, but this has a bunch of his funny quotes. This post is my collection of amazing Henry quotes. I make four-legged friends wherever I go! And even some two-legged ones. I'm also pals with a three-legged bear, but that's a story for another time. Did you catch something? ...Ooo, are you CONTAGIOUS?! Finally switched avatars! Nya ha! Honestly, I'm neutral between cats and dogs, but my brother likes dogs more, so I chose that. Schools out! Hurray! I'm going to try to be more active around here. It probably won't be very hard, with all of the upcoming E3 news. Soon It'll be summer for me and I'll probably be more active here. Also, I really need a new avatar. I've had this one for way too long. One thing that annoys me a ton is when people spell "definitely" as "defiantly". Seriously people. C'mon. It's not that hard. What the heck happened? I chose a horrible day to log on to Smashboards. In other news, I had no clue there was a Nintendo Direct today. ...Until Chrom showed up and you got rekt. Hah! I conquered him long before the game began. The whole game, he was just acting. I faked losing. This is probably the longest I've ever been with one avatar. I've had it for nearly half a year. Read the "Anyone looking at this profile post has now been conquered" post. Touche. But what if they can't read? It doesn't matter if they cant read the post. They still get conquered. The post is just to inform them that they got conquered. Hey. Rocket Raccoon wanted me to tell you that he's banned, but he can still talk in the Pokken group I believe. Kay. Thanks for telling me! We have a thread for Magikarp. 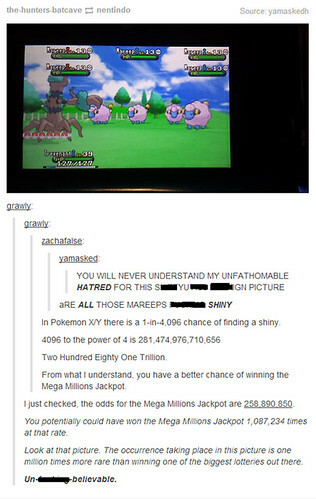 The info in that thread supporting Magikarp is legit. Okay then. I'll check it out. Wow, I have a stickied thread. I feel special now. Thanks to O D I N for the awesome signature! YOU FOUND ONE OF THE RARE LEGENDARY FUJINS AND DIDN'T TELL ME!?!?!? After that whole thing with you not knowing about Fuujin this summer, I didn't know you would be interested. I know the smilies don't work, but saying :troll: is better than saying nothing. I'll update my Captain Falcon guide soon. Thank you for your input.